Coty, can you help with my Son's wedding, don't worry it's only a very small family wedding at home in the garden? ...and a garden wedding, how wonderful, I wonder what the weather will be like!! 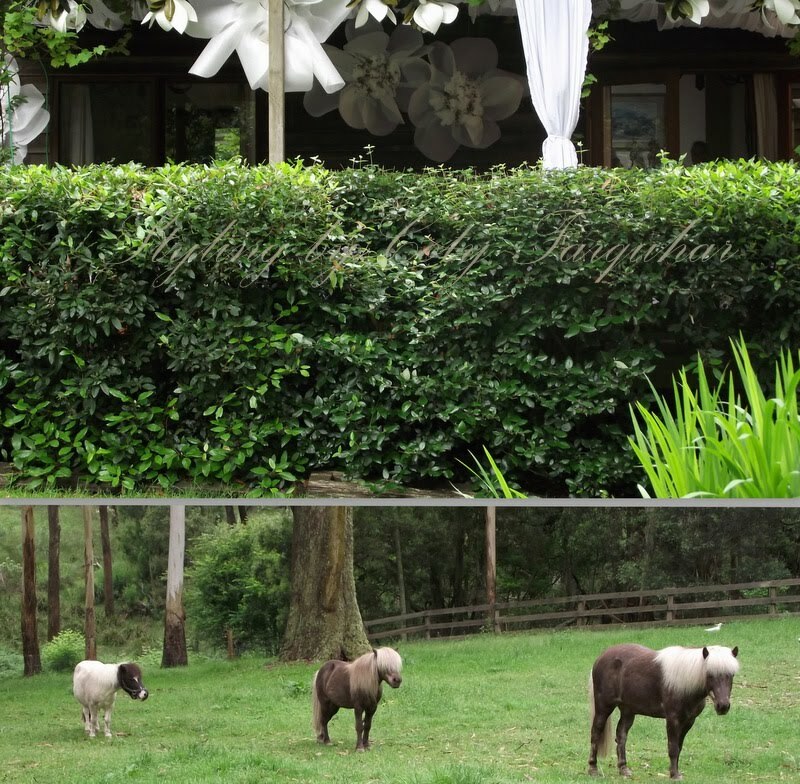 On a lovely old property in the Southern Highlands with animal life in every direction you look was the setting for this celebration. Australian birds everywhere, each with their own names, parrots, black cockatoos, little ponies and lots of gorgeous family dogs. And lots of "laughing" Aussie Kookaburras... and for those that don't know, when a Kookaburra laughs, it means there is rain coming. A couple of days before the wedding I woke Andrew and said, Darling...I think you need to put up a roof over the veranda where all the seating & dining area was planned to be and also I need to drape the ceiling with organza fabric, I was starting to worry. Poor Andrew!! I'm sure he wonders sometimes what it would be like to "not" be married to a stylist. and .... the marriage ceremony under the Gum trees was definately out!! Where could they get married now? In the house?...hire a tent? ....or......transform one of the old barns? This small wedding had just turned into a huge event just like that. I also had to rethink all the decorations as well which were to be made out of fabric and paper. Waterproof flowers were needed!! can you just imagine... yes, waterproof flowers!! In the pouring rain, Andrew covered the veranda with new roofing, we soaked up all the wet & slippery floor & dance area with bags & bags of sawdust from our workshop. It's actually great stuff, we did sweep it away, but it looked great as a ground cover! I may use it for another event one day. The barn, well, we all love barns, they're charming and it was just the perfect shaped barn, but this is a working property and the barn is the workshop and it was also used as a garage. So, where does all this gear get moved to? in the rain? and how do we clean it up to look as beautiful as possible for the bride and groom in a couple of days? Did I mention before, the wedding that originally was only going to be small gathering with just the family, now grew to 55 guests, plus caterers, waiters, photographers and more. Yes, lots of cars, vans and lots of people. and, we did it..... with the help of everyone, we managed to transform the barn into a chapel, the dining area stayed lovely and dry and everyone had a great time. 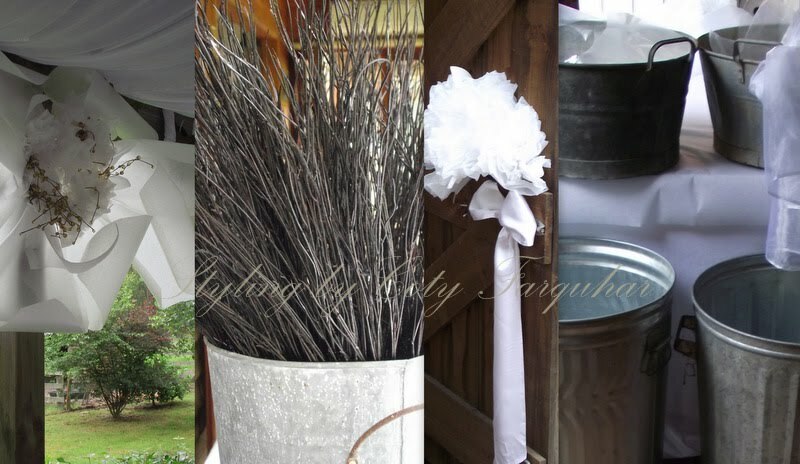 The style of the wedding was to be "rustic & country" with a soft touch of draping and flowers. Easy, especially when this property had some great rustic pieces already scattered around the grounds, like the moss covered table above that we moved into the barn and used as the altar. The bride choose the little blue and yellow buckets that held a white potplant in each and the bar was set up with lots of feed buckets and great old tin containers to hold the ice, champagne and wine. We draped the ceiling with a stretchy elastic style fabric, instead of the 100 metres of beautifully ironed (by me) organza fabric. It kept it's shape no matter how wet it got. I made extra flowers for the veranda from a wonderful thick artifical wrapping fabric that looked beautiful with droplets of rain over them. 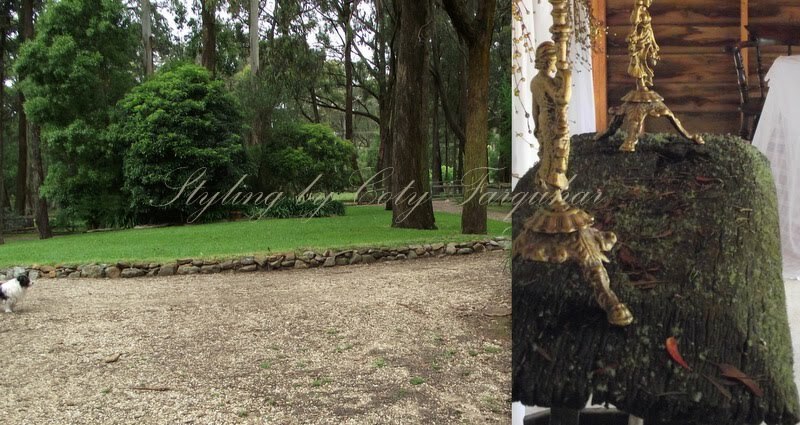 What a wonderful setting it was, the garden with the huge old gum trees in the background, the ponies happy in the paddocks, the birds in the trees and the dogs with little white bows around their collars. The rain stopped for a couple of hours just as the bride arrived.. gumboots were certainly the fashion of the day. I don't think any of the guests had any idea of what the previous week was like and they all had a fabulous time. My heart goes out to all our Australians up North in the Queensland Flood Disaster. When I wrote this post a couple of weeks ago I thought we had a stressful time with this little bit of rain. Well, it's nothing, absolutely nothing compared to what has been unfolding in Queensland. It is so hard to believe what has happened, the sadness and loss of life, homes, businesses, loss of roads, bridges and infrastructure. I know it will take a very long time before the many thousands of lives are back to normal. I really wish there was more that we could do from down here. Maybe over the coming weeks there will be something we can all do to help. What a lovely setting for a Wedding, and you did a marvelous job especially with such short notice with the rain. I am sure the happy couple was delighted. Very nice photos. As always you did a spectacular job. Your hubby is a jewel and he did superbly! I too am deeply saddened for all of your countrymen in Brisbane. Everything is so fabulous. Quite a lot involved. Words are not sufficient for the tragedy in Australia. My prayers go out for them. Hi Coty - I just wanted to tell you again how much I love your blog, and now I have just discovered Bec's charming blog, as well. What a talented family you are! Thank you. Stunning as always Coty - even with the rain! The flooding is just too much - prayers for all involved , both now and as the cleanup begins.